Paul Holleran has admitted the free midweek came at the perfect time for his in-form side. 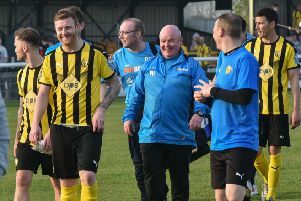 Saturday’s 2-0 win at Merthyr took Leamington’s points haul to 16 from 18 and temporarily lifted them into the Southern Premier Division play-off places. Hungerford leapfrogged them on Monday night with a 3-1 win over Paulton, but with games in hand on four of the five teams above them, Brakes’ destiny is still very much in their own hands. However, after hosting Poole and Dorchester in the next four days, seven of their final ten games are away from home and Holleran said the blank midweek had given them a chance to regroup before embarking on a season-defining period. “The players needed a break after four or five Tuesdays on the bounce,” said Holleran. “I said to (secretary) Rich Edy when he was doing the fixtures to keep this week free as it’s about half-way (in the run-in). “We’ve got a few knocks and a few bumps and bruises and I’ve given the players a few days off. “The Tuesday night trips are always harder and we’ve got a few coming up with Chesham, Weymouth and Kettering. “But we’ve had a good batch of games - and we needed to with all the teams around us picking up points. A win for Brakes against Poole tomorrow would see them cut the gap on the leaders to six points having played a game less. And, while Holleran insisted his side would be going all out to claim the three points, he still cannot see past Tom Killick’s side for the title. “It’s still theirs to throw away. “Realistically, we’ve got too much to do. “We’ll try to put a spanner in the works to put pressure on them, but I’ve seen them twice this season and they are the best equipped side in the league. He continued: “There’s no pressure on them to win tomorrow and they’ll be content to counter-attack. “But hopefully, we can get the three points, put them under a little bit of pressure and see how they respond. Despite the impressive run which has lifted Leamington up the table, Holleran admits their lack of goals is still a concern, with the only three teams to have scored fewer than Brakes all residing in the relegation zone. “The previous time in this league, we had Matty Dodd, Lee Chilton was a bit younger and we had Stefan Moore. “We’re a slightly different team and set up slightly differently this time around. “We haven’t got as many goals from all areas as we did. Jack (Edwards) chipped in on Saturday but we haven’t scored as many goals from all areas of the pitch as I would have liked. And, while he believes the title may be beyond his rejuvenated side, Holleran sees no reason why they cannot gatecrash the play-off party. “What has gone on before has been foreplay. “All the previous games don’t count for anything now. It’s all about who can deal with the pressure in the run-in.